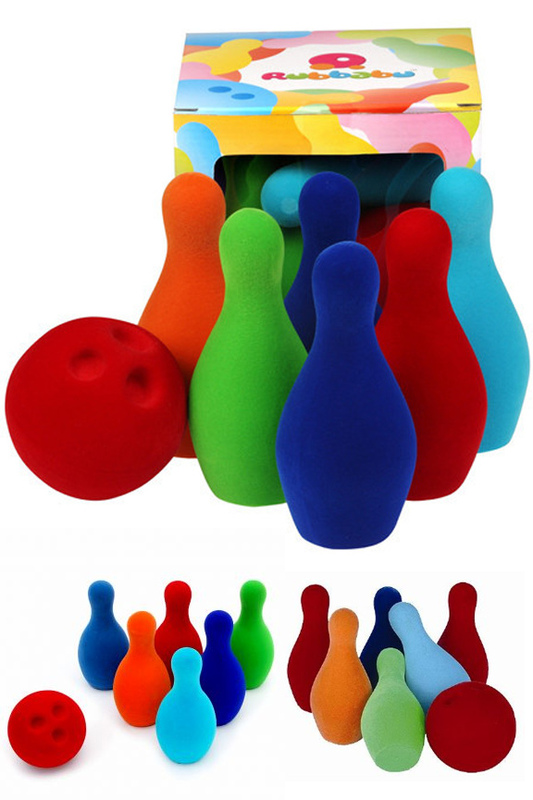 A durable, and eco-friendly set perfect for any bowling fan. 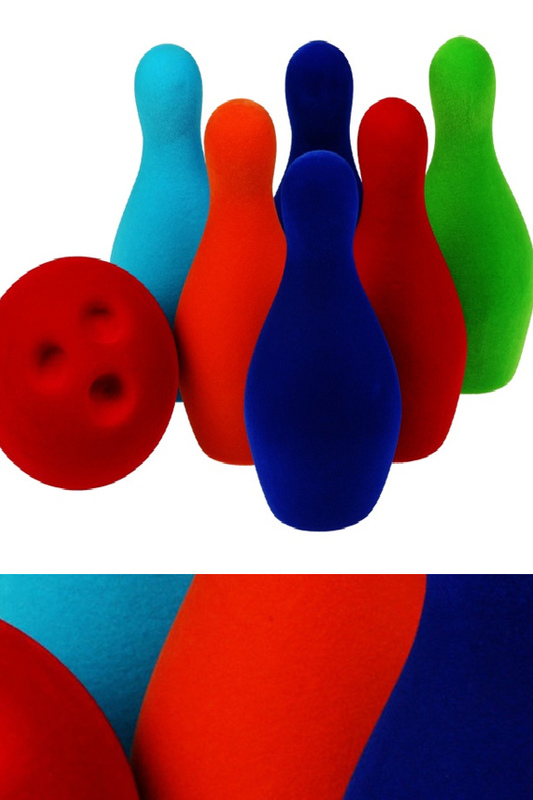 Get six pins and one ball, all made from a natural rubber material. Each piece is a replica of the real thing, and the substantial material makes this set more fun than other similar options. The pins will stand steady until rolled into, and the ball has enough weight to knock them all down. Let kids roll like a pro as they attempt to score strikes and spares, but never worry about stuff getting broken, or kids quitting in frustration. The squishy material makes them easy to grip, and ensures better control, and if accidents happen, nothing will get damaged, and nobody will get hurt. Each piece has its own bright color, and every piece is completely coated in a velvety soft nylon that is irresistible to kids at any age. Complete with mock finger holes in the ball, and authentic shaping on each pin. Let children keep score and play the real game, or watch as it triggers imaginative play not thought of, and smile as it gets the creative juices flowing. Biodegradable. The natural rubber material is made from pure tree sap with no fillers. It is totally safe and environmentally friendly. Durable. Pretty much impossible to break, the pieces in this set can take tons of abuse without showing it. Safe. Soft and squishy to prevent damage and injuries, but also anti-microbial, dust mite resistant, mildew resistant, hypo-allergenic and flame retardant for added protection. Fun For All Ages. Safe for the youngest among us, but also irresistible for older children and adults alike. It can be used as a game, or for imaginative play that breaks the rules. Play with your children, or have them explore on their own. Sense-ational. Bright colors and fun shapes appeal to children visually, and the velvety coating stimulates their sense of touch. Real Life Game Play. A scaled down version of the real thing, the substantial materials make this more like real bowling than other plastic sets. One of the strongest and most environmentally friendly choices in toys, this manufacturer makes all of their products from a renewable resource instead of wood, plastic or other materials. Real tree sap is processed into durable rubber, and that material is hand crafted into vibrant toys that squish in little hands. Constructed using the best materials possible, they are made in India, but the paint is US sourced, and the flocking comes from the leading producer in Switzerland. Void of common fillers and softeners, each piece is totally BPA free and pthalate free for safety. The toys themselves are biodegradable, and most byproducts that result from manufacturing are recycled and used again. The award winning line is continually growing to add new and unique product offerings due to growing popularity. If you are looking for a high quality item with the looks and play-ability to back up the claim, then look no further. Order Yours Today! Dimensions 8" x 7" x 4"
A durable set that will last. Encourages motor skill development, cooperative play, basic math and more. Let them knock down pins without worry because the soft parts are safe for any location. Order Yours Today! The Rubbabu Bowling set, is it the type of thing my 6 year old son can stand up straight and bowl or is it table top size? The pieces are pretty big, so most kids play with it on the floor.